“I think this came into the small Quaker library in Durham Jail soon after publication in 1917. It was a great discovery for all of us and helped to bring Fox’s Journal, Sewell’s History and a lot of the early journals to life. Two which I was reading when this appeared were Stephen Grellette and Caroline Stephens, and I bought copies of all three as soon as I could, after my release, and still value them. They are very precious. It was a great stay and strength in jail for many of us”. The annotation is a wonderful example of provenance: how evidence left by a book’s owner can tell us more about the book itself and the person involved. Raistrick at the time he was imprisoned was not actually a member of the Society of Friends: he joined later, in 1919. However he was clearly already sympathetic to their ideas. This little note shows how important Quaker ideas and history became to him. It also illustrates his deep interest in the writings of past Friends. He built up a large collection of such publications, many now held by Special Collections at the University of Bradford, in the Quaker and Raistrick book collections. His interest in Quaker history also linked up with his love of Yorkshire landscape, as he developed interests in the study of lead mining and other industries with strong Quaker connections, especially the London (Quaker) Lead Company. Witness books by Dr Raistrick such as Two centuries of industrial welfare, Silver and lead, and Dynasty of iron-founders (about the Darbys of Coalbrookdale). Raistrick’s books generally are full of intriguing provenance: he was a great annotator and liked to explain how he came by his books. 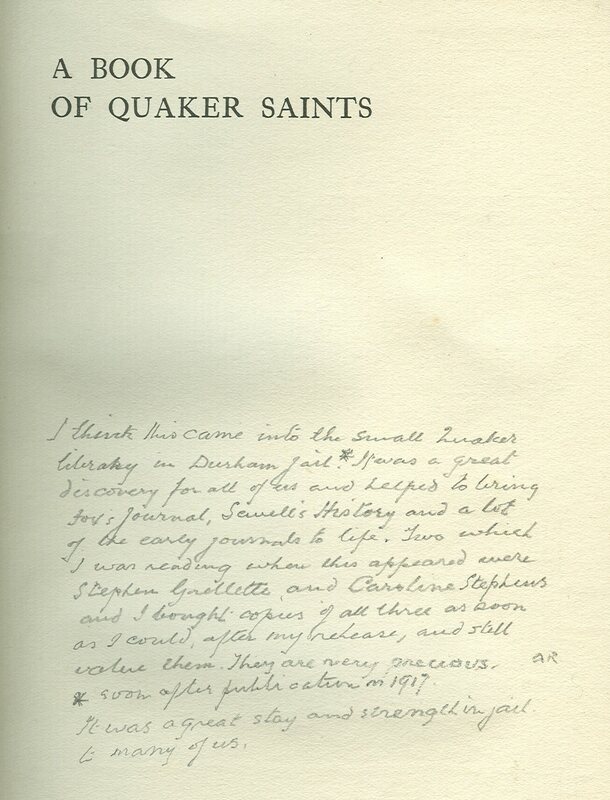 For instance, this copy of Quaker saints also includes the note, “Arthur Raistrick 1919 given to me on my release from prison Sept. 1919”. It is particularly pleasing that we have Raistrick’s copies of the other works he mentioned in the featured inscription: a memoir of Stephen Grellet by William Guest, and Quaker strongholds by Caroline Stephen. An inscription in the latter gives us another aspect of Raistrick’s wartime imprisonment: “A. Raistrick No. 4559 B.2.17. H.M.P. W.Scrubbs. 1.4.1918.” i.e. Wormwood Scrubs. This entry was posted in History, Peace, Quakers, Yorkshire and tagged Arthur Raistrick, Books, Conscientious Objectors, Prisoners, Quakers, Society of Friends, Special Collections. Bookmark the permalink.